Push button electric control panel. Required power: 2HP Single Phase + 3 hp 3phase. Length of con: you can change mould for different size. Die mould size: Dia. 10” of 12 cavities. Cylinder: 160 x 850 stroke length. Conveyor: 150 x 780 mm. Machine Speed: 120-150 cone/minute (Depends on size). Electric control panel with variable speed drive. Required power: 2.5 HP 1phase. · Warranty: 9 months only on main motor. · Machine Speed: 200-300 cone/minute (Depends on size & Material). · Push button electric control panel with variable speed drive. · Required power: 3.5 HP 3 phase. · Conveyor system in built. · Fully automatic machine. · Free: Material mixing formula, contacts of raw material supplier, Training of machine operating and general maintenance. · Warranty: 9 months on main motor. Production Capacity 200- 275 kg. /8 Hr. Production Capacity: 200- 275 kg. /8 Hr. 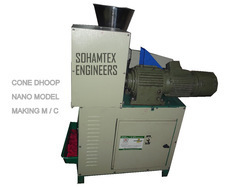 Automatic Cone Dhoop Making Machine. Required power: 2HP Single Phase 3 hp 3phase. 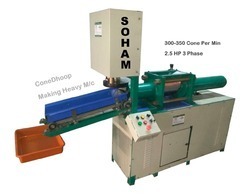 Machine Speed 200-300 cone/minute (Depends on size & Material). Push button electric control panel with variable speed drive. Required power 3.5 HP 3 phase. Fully automatic machine. Free Material mixing formula, contacts of raw material supplier, Training of machine operating and general maintenance. Warranty 9 months on main motor. Count of cones per minute 200-300 Cone per MIn. Production Capacity: 200-275 Kg. per 8 Hours. Count of cones per minute 75-150 Cone Per Min. Production Capacity 100-150 Kg. per 12 Hours. Machine Speed 75-120 cone/minute (Depends on size & Material). Required power 2.5 HP 1phase. Warranty 9 months only on main motor. Count of cones per minute 75-120 Cone per Min. Production Capacity: 100-150 Kg per 12 Hours. Looking for Dhoop Cone Making Machine ?